Trevor Plouffe drove in two runs in the first inning of Game 1 and that was plenty of support for Enyel De Los Santos. In a battle of the top two teams in the IL North, the Lehigh Valley IronPigs and Buffalo Bisons split a doubleheader Tuesday Coca-Cola Park. Game 1: The Pigs took the first seven-inning contest 2-0 on the back of a complete game by Enyel De Los Santos (7-3). Lehigh Valley scored both its runs in the bottom of the first inning against Buffalo's Nick Tepeshe (0-1). De Los Santos continued to dominate the IL with the Pigs' first complete game shutout of the season. Lowering his IL-leading ERA to 1.47, De Los Santos struck out seven and scattered four hits in the outing. This is the fourth time this season that De Los Santos has not allowed a run in an outing and the 10th that he has allowed less than two earned runs. 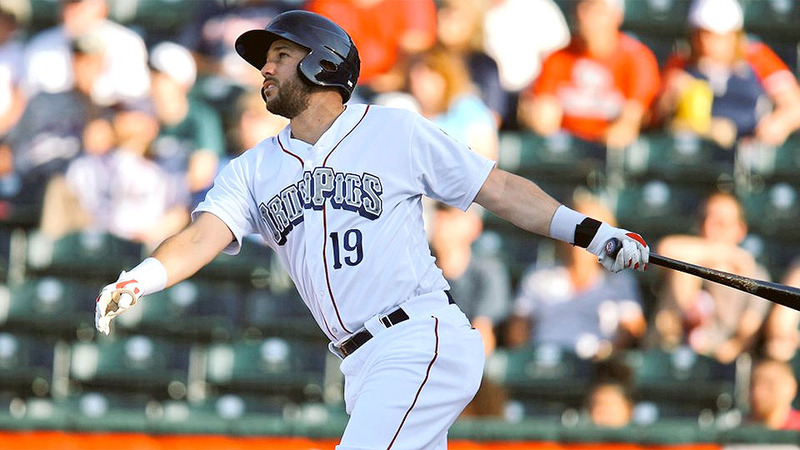 Trevor Plouffe put the IronPigs on top with a two-out double. After a walk and single by Mitch Walding and Joey Meneses, Plouffe lifted a double past the dive of Buffalo center fielder Anthony Alford to score the only two runs of the game. Game 2: After the Pigs took an early lead against Buffalo starter Luis Santos (1-0), the Bisons responded with a four-run top of the third against Tom Eshelman (1-6) in a 9-2 victory. Eshelman was lifted after 3 2/3 innings and allowed seven runs on 10 hits. Buffalo got a pair of home runs by Reese McGuire and Rawdy Tellez in the nightcap. Tellez and McGuire each had three RBI and combined to go 5-for-10. Dean Anna finished the game with two hits and run scored. Anna also drove in the Pigs' other run. The Pigs and Bisons wrap up their four game series tomorrow night at 7:05 p.m. It's Faith Night at Coca-Cola Park. Prior to the game, 3,000 fans 18 and older will receive an IronPigs T-Shirt presented by Dorney Park. Brandon Leibrandt will start the game for the IronPigs.